Designed to offer essential information on-the-spot, where it's needed most! RAPID ACLS, 2nd Edition, Revised Reprint is now updated to reflect the 2010 emergency cardiovascular care guidelines. It contains a broad range of topics pertaining to advanced cardiac life support including information on airway management, pharmacology, vascular access, ECGs, electrical therapy, acute coronary syndromes, and special resuscitation situations. 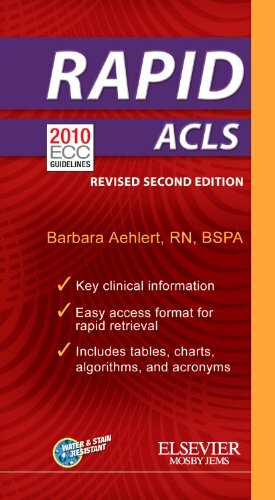 Loaded with tables, mnemonics, and algorithms throughout, RAPID ACLS, 2nd Edition, Revised Reprint is ideal for use in clinical practice or during an ACLS course. Compact 3 x 5 ½-inch size presents essential information in a quick-reference format. Fluid-resistant paper is durable for rugged clinical use. Convenient format uses spiral binding and color tabs as section dividers allow you to quickly locate important information in an emergency.